We came across a flyer the other day that was produced in 1990 by the Latin American Working Group from the Institute for Global Education. 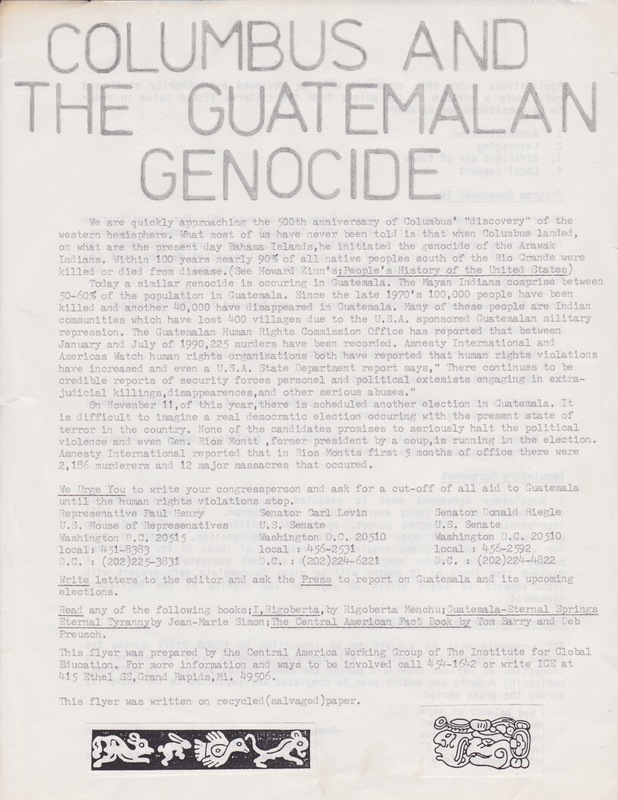 The flyer talks about the Columbian legacy and the genocidal policies in Guatemala during the 1980s. The flyer urges those who read it to become more informed and provided some resources to build awareness. In addition, there was a plea to contact members of Congress demanding they cut off all military aid to Guatemala, military aid that was essential to the Guatemalan counter-insurgency war that cost the lives of an estimated 200,000 civilians. This connection between the legacy of the European Conquest initiated by Columbus was the subject of an inter-continental gathering in Guatemala in 1991 in preparation for the 500 Years of Resistance Campaign. http://articles.baltimoresun.com/1991-10-13/news/1991286031_1_christopher-columbus-guatemala-indians The 1991 gathering in Guatemala gain so much attention that the Nobel Peace Committee chose Guatemalan Mayan activist Rigoberta Menchu Tum as the 1992 Peace Prize winner. Here is a digital copy of the flyer from 1990. 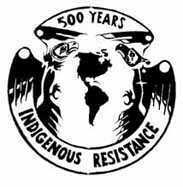 This entry was posted in Central American Solidarity Movement, Indigenous Resistance and tagged 500 years of resistance, Grand Rapids Central American Solidarity flyer, Guatemalan genocide. Bookmark the permalink.